culture of western North Carolina, a leader in implementing sustainable agriculture by supporting local growers and building a “field to table” food chain. This region is not unique in its efforts to get locally-grown food in stores, restaurants, and homes, but its approach and commitment makes it a good example to examine. is located about thirty miles east of Asheville, the cultural and economic hub of the region. Asheville embraced the local food movement early and rebranded itself as “Foodtopia.” Most of the city’s many restaurants serve local produce, meat, fish, and eggs. Your waiter or waitress will be glad to tell you where the food you are eating came from and when it arrived. You will even see photographs of the farmers who grew your food on the walls of some restaurants. Asheville, also home to several local breweries, welcomes thousands of visitors annually, many of whom return home inspired by the local food culture and eager to develop a local food chain in their own communities. While it is not surprising that a large town like Asheville would undertake such an ambitious initiative, it is impressive to see how the enthusiasm for fresh local food has spread throughout the region and transformed communities like Waynesville. Most of Waynesville’s restaurants buy their produce, beef, chicken, eggs, honey, and trout from local growers; some chefs even choose to start their own herb and produce gardens. Many of the local growers began as vendors at the Haywood Historic Farmer’s Market, held every Wednesday and Saturday just a few blocks from the downtown commercial district. The market makes shopping festive by including crafts, live music, and occasional special guests. During my most recent visit I talked with a produce vendor who was also selling his harvest to a new restaurant where my wife and I had eaten the evening before. I was also surprised to find a vendor making and selling mozzarella cheese. retirement homes. Nearby Jackson County has already launched a Farm to School Movement where students will learn to grow and prepare the food they eat. Farm to School is a project of the Appalachian Sustainable Agriculture Project, funded by the Kellogg Foundation. sausage using local beef and pork. Just down the street, Café 50, a charming, casual eatery, uses the slogan “Fresh not Frozen” to describe its offerings. The café’s Blueberry Strudel is a delight that lingers in my memory and the daily quiche special is always loaded with a variety of fresh vegetables and herbs. Humboldt Fog Farm goat cheese, green apple-almond vinaigrette, and peach jam. Entrees make equal use of local products. I have tried two that I look forward to enjoying again: a Goat Cheese –Pancetta Frittata, with spinach, roasted pepper, caramelized onion, and basil; and Angel Hair Caponata with artichokes, eggplant, fennel, olives, fried capers, basil, and lemon. The Frogs Leap also uses local products such as Sunburst Trout, Stone Ground Logan Turnpike Grits, and home-grown collard greens. The penetration of the field to table movement has begun to reach grocery stores; the Ingles chain in western North Carolina carries Hydroponic (Living) Lettuce grown year-round at the Shelton Family Farm in Whittier; cabbage from the Hollar and Greene farm in Boone; and cucumbers and apples from a number of local growers. The CSA (Community Supported Agriculture) movement has also caught on in many communities customers subscribe to a farm, purchasing a one-year share. Each week, shareholders receive a box of whatever is in season. Several North Carolina colleges, including Warren Wilson College, have embraced the movement; Warren Wilson College raises 100% grass fed beef and humanely-raised pork, as well as creating a variety of specialty sausages. The new food culture of western North Carolina did not emerge overnight. Both growers and chefs that I have talked to say it has taken a decade to educate restaurant owners, farmers, and customers about the value of eating fresh, local food grown by people you know. Locally grown food is still more expensive than the food purchased by the truckload available in most grocery stores, but the gap has begun to shrink as growers become better organized and learn how to strengthen the local food chain, schools and hospitals see the value of purchasing and serving locally grown food, and consumers begin to understand the health value of “fresh, not frozen” food. Conscientious consumers also realize the critical importance of supporting farmers in their own communities. Corporate farming has decimated the family farm, once one of our countries greatest strengths. The field to table movement has given many small family farms opportunities to once again do what they have always done best—feed America. It also gives struggling rural communities the opportunity to reinvent themselves with regular markets, food festivals, and cozy eateries serving outstanding fresh, local food. Home-made food products—jellies, jams, sauces, dried herbs, smoked meats, and baked goods—add value to fresh foods and can energize the economy of small communities. Much of the United States has yet to embrace the field to table movement for obvious reasons of weather and geography. 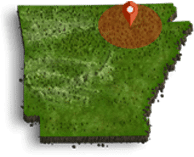 Most of the Ozark Foothills, for example, is far too rocky to grow much of anything.